Listening to Most of the Remixes...* Soulwax has done, I couldn't help but think back to Japie Stoppelenburg's review of Simian Mobile Disco's Attack Decay Sustain Release. It's a good review, and you should read it. It touches on the confusion of how to analyse music. Particularly in our transitory age, I wonder if there is even any use in reviewing things as a whole piece, in the format of an album, which is a construct dictated by technology to begin with. Sure, it carried over into the compact disc era as far as how we write, but the format of an album came from vinyl, where you had two separate 15 to 25 minute sides that were eventually warped into concept "albums" and then double LPs with such ambition and scope that one record couldn't hold them and then CDs, where eventually everything tried to push 70 minutes regardless of content or cohesion. 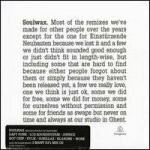 Well Most of the Remixes encompasses two compact discs, and ultimately offers 125 minutes worth of music. Quantitatively, it's an embarrassment of riches, offering hyper-charged remixes and recontextualizations of some of today's hottest tracks as well as songs Soulwax was eager to pay homage to by changing. One disc is standalone remixes, and one is a longer mix of more remixes. There is some overlap. Listening to each disc kind of illustrates what Soulwax are up to. As remixes should be, these are DJ friendly, starting with the simplicity of a metronome (giving the jock the chance to sync beats and blend) before exploding (this is where the crossfader turns over for good, or for a few minutes). The second disc demonstrates how well these renditions work in the context of a dance mix. The problem, if you are a listener who bought the CD, or the solution, if you are a DJ who needs to maintain maximum energy in the club, is that Soulwax remixes tend to be pitched as maximally as possible, perfect for the peak of the set but exhausting to sit down and listen to at home. Nearly every cut here has momentum and cleverness to spare. Members of Soulwax are responsible for 2 Many DJs, who kicked off and mastered the mash-up mania of a few years ago with hits like the combination of Kylie Minogue's Can't Get You Out Of My Head and New Order's Blue Monday. Tracks here, including a Soulwax exploration of the same Minogue hit, use this capacity for clever interpolation as well as driving club mastery in a series of re-imaginings that vary between classic and at least bound to make the dancefloor happy. A great example is LCD Soundsystem's Daft Punk Is Playing At My House, which retains and enhances a driving dance song while incorporating and delightfully abusing samples of Daft Punk landmarks. Stoppelenburg's review pondered the difficulty of reviewing something that functions perfectly in the club while leaving one cold and hollow alone on headphones. On headphones, the Soulwax remixes can poke out in unpleasant ways, seeming like distractions and noisy delays. In the club, they have the power of Greyskull. Stoppenlenburg eventually resolved to average the two scores, and so shall I. In the club, these are an 8 or 9, and at home they are a 6 or 7, full of craft and excitement but ultimately distracting. I'll up the 7.5 mean to an 8 because this is great music that gets my blood pumping and makes me want to dance or fight or something. * The full title of this collection is Most of the remixes we've made for other people over the years except for the one for Einsturzende Neubauten because we lost it and a few we didn't think sounded good enough or just didn't fit in length-wise, but including some that are hard to find because either people forgot about them or simply because they haven't been released yet, a few we really love, one we think is just ok, some we did for free, some we did for money, some or ourselves without permission, and some for friends as swaps but never on time and always at our studio in Ghent.